Jerry Portnoy has had a truly historic career in the blues. He was born in 1943 and grew up in the blues-rich atmosphere of Chicago's famous Maxwell Street Market during the golden age of Chicago Blues. He began playing professionally in the late '60s and since that time has performed, live and on television, for millions of people around the world. 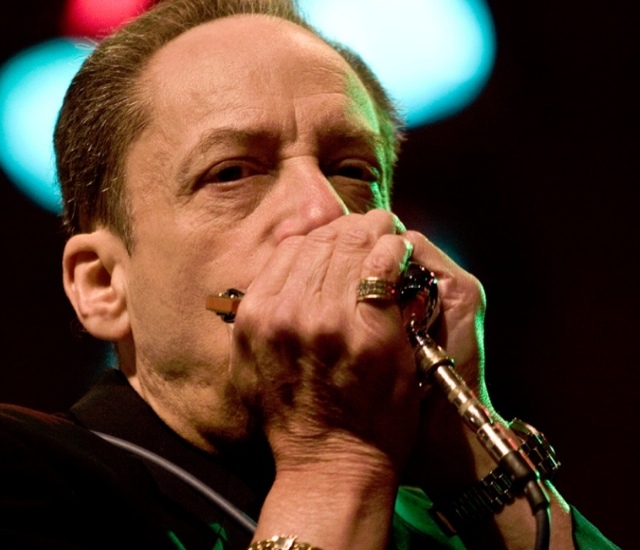 During a career that includes six years occupying the famed harmonica chair in the great Muddy Waters Blues Band, six as leader of the Legendary Blues Band and four as a featured member of the Eric Clapton Band. Jerry has performed at the White House, Carnegie Hall, the Newport Jazz Festval, the New Orleans Jazz and Heritage Festival and London's Royal Albert Hall. Jerry played on three of Grammy Award-winning albums with Muddy and Eric Clapton, and was a Grammy Award nominee in 1997 for his work with the Muddy Waters Tribute Band. Television credits include appearances on Saturday Night Live, Soundstage, MTV, VH1, and the Disney Channel, as well as writing and performing original music for Sesame Street. Jerry has lectured at the Berklee School of Music in Boston, and his definitive 3/CD instructional package, Jerry Portnoy's Blues Harmonica Masterclass, is widely regarded as the premier teaching tool for those wishing to learn the instrument.